To edit these options using the Rtconfig Editor, select Vistasource → Settings → Rtconfig Editor. The editor contains a generic tab as well as tabs representing the installed and licensed engines, e.g. RMDS (RFA), RMDS (SFC), Bloomberg, Netfeed, and WebData. We strongly recommend that you consult a system administrator before editing any options. If RTSHARE is installed, only a few RTW options on the generic tab are relevant. These options apply to the status window for the RTSHARE Client and the option 'No Excel Event.' There is no separate RTSHARE tab. For more information about the RTW options applicable for RTSHARE, see Status Window Options and No Excel Event under Administration of RTSHARE. The generic tab on the RTW rtconfig Editor dialog contains generic RTW and general RTW engine configuration options. These options refer to the sections “Generic RT Engine Settings” and “RTW Settings” in the rtconfig file. To manually edit the generic RTW configuration options in the rtconfig file, see Manually Editing the rtconfig File. We strongly recommend that only system administrators or experienced users make changes to the configuration options. 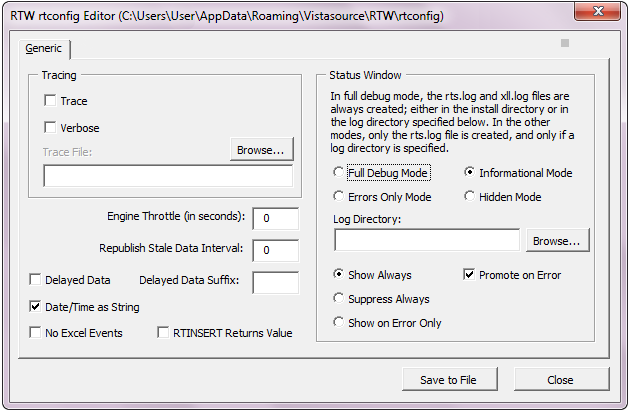 Select Vistasource → Settings → Rtconfig Editor to open the RTW rtconfig Editor dialog box. After setting the configuration options, click Save to File to save your settings in the rtconfig file. To close the dialog box without making any changes, click Close. If you made changes and click Close without first saving to file, a caution window opens to prevent an unintentional discarding of unsaved changes. When editing configuration options, changes to the RTW Engine settings require a restart of the RTW engine. Changes to the generic RTW options require a restart of Excel. Refers to the rtconfig file option “Trace”. Tracing collects a detailed log of engine initialization, all transactions between engine and data distribution system as well as general information. It is typically used to debug network or connection problems. In order to obtain tracing information, select Trace. This option is turned off by default. To collect more detailed information, select Verbose (in addition to Trace). The trace information is written to a file. Enter the name and directory location of this file in the field Trace File. You can browse for an existing trace file or create a new one. Turn Trace off, when it is no longer needed, because it significantly slows down the performance of the software. Setting a specific value (in seconds) defines the interval by which the engine sends updates to RTW. The default value is 0 seconds and implies that the engine should send data as soon as it is available. which sets the interval after which the engine will republish each field value. Intervals between 1-3600 seconds (1 sec to 1 hour) are permissible. If no new value is received within the specified interval, the current value is published again. By default, this option turned off. When set, the published value from a successful publish displays in the formula cell instead of the string OK. By default, this option is turned off, and OK will be returned. which specifies how date and time fields are handled when subscribing and publishing. If checked, date and time fields are treated as strings. This option is checked by default. If unchecked, date and time fields are treated as spreadsheet date and time values. which specifies whether RTW listens to certain Excel events. If you add RTW to an installation that also includes other add-ins listening to Excel events, these add-ins may not receive the events that they are waiting for if they are loaded after the RTW add-in is loaded. If checked, RTW is no longer listening to Microsoft Excel events, thereby allowing other add-ins to properly trap the events. By default, this option is turned off. If this option is selected, the RTW menu items will not always be enabled or disabled as appropriate, for example when there is no workbook in Microsoft Excel, or when no engines are running. With the No Excel Events option selected, the RTW wrapper functions no longer automatically calculate when the file is opened, but require a manual calculation to start them. See RTW Functions for more information regarding the wrapper functions. The WorkbookBeforeClose event is used to prevent the RTW Add-ins from being unloaded when the user exits a work book, but then chooses to cancel the operation. With the No Excel Events option selected, this functionality is no longer available. The WorkbookBeforeSave event is used to maintain any RTW settings that are saved with a workbook. With the No Excel Events option selected, this functionality is no longer available. These settings control what information is logged to the status window and when the status window should be displayed. The following options apply to the rtconfig file options “rtexcel:SWOption” and “rtexcel:SWDir”. Logs engine start, warnings, errors, other status information and debugging information, and generates two files: xll.log and rts.log. By default, these files are created in the default installation directory. You can browse to change the log directory. Logs engine start, warnings and errors. The log file rts.log will only be created if a log directory is specified. Logs errors only. The log file rts.log will only be created if a log directory is specified. Status Window is never displayed. If selected, the menu option Vistasource → Info → Show/Hide Status Window is disabled. However, the log file rts.log will still be created if a log directory is defined. If Full Debug Mode is turned on, two log files are created; xll.log and rts.log. If no log directory is specified, the files are created in the RTW installation directory. To use a different log directory, specify one here. If Information Mode, Errors Only Mode or Hidden mode are selected, and a log directory is specified, then the log file rts.log will be created. To specify a directory, enter a directory in the Log Directory field or browse to a directory of your choice. The following options refer to the “suppress_rt_status” and “rtexcel:SWpromote” rtconfig settings, which define when the status window is displayed. The default is Show Always. The status windows displays the first time a real-time request is made. The status window is not displayed, except when Vistasource → Info → Show/Hide Status Window is selected. The status window only displays when an error occurs. The status window is promoted to the foreground when an error is encountered. When manually editing the parameters in the rtconfig file, empty spaces are not supported. For instance, use Trace:1, not Trace: 1. Any line beginning with a pound symbol (#) is interpreted as a comment line. Active options must not be preceded by this symbol. In most cases, editing a configuration option requires modifying pre-defined options. Changes to the RTW Engine settings require a restart of the RTW engine. Changes to the Generic RTW options require a restart of Excel.